another lunch: The Lunch Punch ~ Sweet set! giveaway!! That's what I was singing when a box full of the newest Lunch Punch sets arrived at my door. Oh, yes. There was singing. And skipping. And dancing. And squeels. It was a happy time! The new shapes are all super sweet. There is a giant cupcake, a gumball machine, birthday cake and two ice cream cones.﻿... yummy! I have been having so much fun playing with these new Lunch Punch shapes! 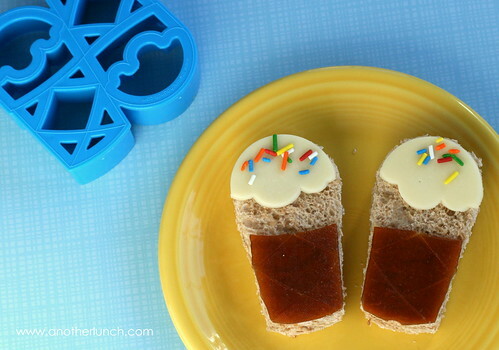 If you are into sandwich decorating, the possibilities are endless with this theme! The first sweet sandwich I tried my hand at was the gumball machine. The review from my four-year-old daughter, "it was dewicious! you weally need to put meminems on my sandwich more often!". The next day she asked for another "gummy sandwich" for lunch. I convinced her that ice cream was also delectable... an ice cream sandwich for lunch. Heck, what kid would say no to that? The Lunch Punches work beautifully. So easy to use, so easy to clean. So cute. 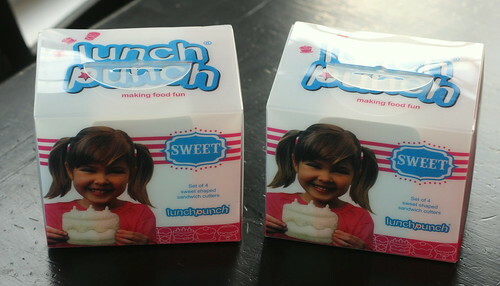 To share the love, I'm giving away two of the Lunch Punch Sweet sets! Two winners! Oh yeah! This giveaway will run until Sunday night, November 20. I'll announce the winner the following Monday morning. If you just can't wait that long, you can order a Sweet set of your own on Amazon, right here! They are all ready and waiting to sink into a slice of bread near you! disclosure: I received several Lunch Punch sets to dispense however my little lunch loving heart desired. No other compensation or payment was given. All gushing and reverent remarks are my own. To read about how my relationship with Lunch Punch started, you can read this love letter this past post. Those look awesome! I haven't used one, but I'm working on making my son's lunches more fun so these would be perfect. These are so super cute! And I love your little embellishments. Such great ideas! Love these!!! My daughter would be thrilled to have this for her lunch. Super cute! My kids would love these! I've never used lunch punch sets, but I would love to stocking up for my own bento supply!! YEA Lunch Punch! I want a lunch punch!!! Very cute! My daughter is in preschool this year and I love trying to make her lunches cute...these would make her the hit of the lunch room! So very cute. I love both your creations. LunchPunch YEAH! I seem to be constantly on the lookout for cute-food stuff--trying to avert the "I'll assert my independence by saying NO to food" time with my 19mo twins :). So far it's been working, and these would sure help! Oh, so adorable! The birthday cake cutter would be awesome to have for my kindergartener's December birthday! Yay for new LunchPunch shapes! They make lunches so much more fun! How cute. I don't have a lunch punch yet, but would love one. These are great. I only have the puzzle set so my kids are in need of some variety. Those are so stinkin' adorable - and your little additions go the extra mile to make them amazing! We'd love to add some sweets to our collection! My kids would LOVE these! My 5 yr old is always so excited to find out what kind of sandwich will be in her lunch box that day!! love how you decorated the new lunch punches! Don't own any Lunch Punched yet, but I would love to start my collection with these :) Just a newbie with bentos! Those look so cool!! I used the Frog Prince punch today for my daughter's lunch! She would flip for an ice cream sandwich. those looks awesome! i don't have any lunch punches yet. do you think they would work for quesadillas? my son loves them! Can't wait to try these out! We love our other lunch punch sets! Thank you for doing this awesome giveaway! This is the greatest giveaway of all time! wow - how cute. there seems to be everything (except food) to make them from start to finish. I will definitely order them if I don't get lucky. my favorite would have to be the mommy/baby elephant and my daughters would love the princess set!!! So cute! I don't have any lunch punches but i'm working on making my lunches more creative! Oh my cuteness! I have never used one of these for my daughters' lunches but both of them are getting pretty tired of the same old lunches so I'm searching for ways to jazz things up. I LOVE this blog! Ooooh I loved these!!!!!!! Thx for all you do Another Lunch!! My daughter's school lunches would be way more fun with lunch punch! great giveaway. 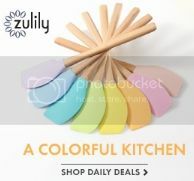 SO excited about the lunch punch giveaway! My boys loved shaped sandwiches and we found some no-name sandwich cutters and they love those, but they are difficult for us to use since they don't cut very well. I have been wanting to try the lunch punches for a while now, so it would be amazing to win this giveaway! Thanks for doing this! soooooo cute. my girls will love this!! I've been making a "special" lunch for my daughter every Wednesday and I've just been cutting them out by hand. This is SO adorable and is now on my Christmas list!!! Oh my goodness! These are the cutest thing ever and I NEED to get them. Thanks for having this giveaway - I love the lunch punch sets! I have never used the lunch punches, but my daughters would love these. I can see the cupcake being a huge hit here! I saw these for the first time just earlier today! They are absolutely awesome! And gender-neutral, too! Plus, I personally LOVE cupcakes of all kinds! These are adorable. My daughter would go nuts over a lunch shaped like that. Thanks for the chance to win! Yeah! Would love a set. Only have a few bento supplies, as much as we can afford. Lunch punch sets would make sandwich cutesifying much easier! So cute!!! My kids would love them! These are so cute! I'm just getting started in bento so these would be great. Those are super cute! I'd like to get my hands on a set! I've been wanting collect lunch punches for a while - looks like it's about time to start! The possibilities are endless!! I would love to win! I would love to win this! We have the puzzle punch and my kids eat way more if I make puzzle shaped sandwiches than if I just give them regular squares. Pick me!!! These look like so much fun. We would love to try them out. These look so cool! reneeas at hotmail dot com. Very cute! I can't wait to try them. We have just recently gotten into muffin tin meals and bento, and I am addicted!! So far I'm just using cookie cutters and one kind of boring (especially since we have used it so much) heart sandwich cutter, but there seems to be a lot of wasted sandwich for Mom and Dad to eat (cause what I need is more sandwich!!). I have had my eye on these lunch punches for a while, and thought I had finally settled on the fairy tale set, but now they came out with this! I might just have to get both! They sure beat cutting the crusts off and having pathetic little remains! Those are super cute! I love your website! Thanks for this fun giveaway! I honestly admit (Please don't hate me!) that I have never seen lunch punch before. So, with the thingamajigs you have shown, I'm going to have to say the gumball machine. SO STINKIN' ADORABLE! I would love M&M's on my sandwiches. Cute overload!! Love your embelishments! Awesome!!! They're just as cute as the SandWishes set. Just started reading your blog; I love your ideas! I absolutley love LUNCH PUMCH!! We have one set and my daughter would love this one as well!! i adore your blog and am eager to get my hands on a lunch punch set - always love seeing what you create! Woohoo for the new punches :) My current favorite is the princess. My girls will be SO excited for these sweet new ones. I would love to enter. I don't have any lunch punches and really want to try it. *Gasp! * These are adorable! 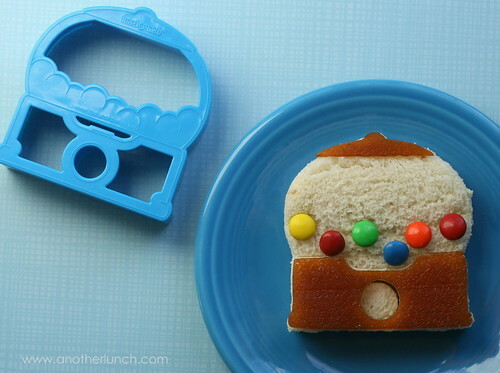 I have had my eye on some lunch punches, but these are the cutest yet! My favorite is the puzzle lunch punch but these look awesome too!! My kids would LOVE these! Please, please, please!!! Those are so adorable! I have been wanting a lunch punch set, buti keep talking myself out of it. This set is too cute to pass up though! Seriously SO cute! We just got the car/train one recently. I've only used the car one so far but it was c.u.t.e! I love the Lunch Punch! This one would be awesome! I have started building my collection(my LO is still on breast milk) so someday soon I can start creating lunch art! AAAAAHHHHHHH!!!!!! SO cute!!!!!! I need these in my life!!! Adorable!! My kids would both be drooling over these beautiful sandwiches!! I love these new shapes - they are adorable. We have one set already, but my girls would go nuts for these. Love Lunch Punch - we use the vehicles set almost every day! I love these new shapes! Those are really cute! I just have boring ol' cookie cutters & silicon cupcake cups doing the majority of the cute-ifying in my daughters' lunches, so they'd be over the moon if I won these! How cute and sweet. The possibilities are endless. Thank you for the opportunity to win them. Super cute! This look so awesome. oooooooh i LOVE them! i have every other lunch punch to date... can't wait to get my hands on these! yay! These are gorgeous..perfect for my daughter but I think my sister would love these too! My girls LOVE their lunch punch sandwich cutters.....Im so proud of them, they have even switched from white to wholemeal bread. My 4 year old asked me what happened to the bread I simply told her 'its just Mr white bread back from his holiday - he has a nice tan doesn't he?!' She was very impressed with my answer ;) lol! Kids, gota love 'em! Ah, my little one would love such fun sandwiches! We don't currently have any, but we'd love to start a little collection :). 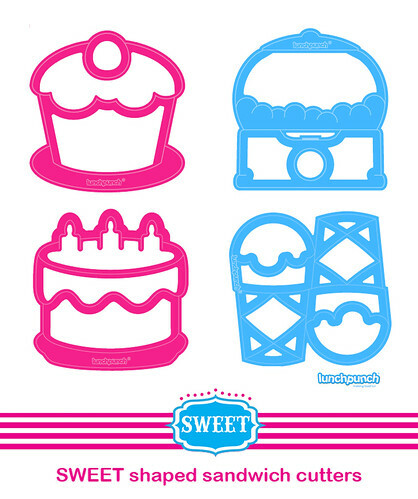 I'm a cupcake girl, my children are cupcake children, so I gotta say my favourite is the cupcake cutter!!! :)) But to be honest, they're all fab! I have been a silent reader, and this is probably the time to shout out how much I adore your blog! Thanks for all the inspiration to make pretty lunches. This set of sandwich punches are PERFECT! My girl and I would love to share a set and say cheers to cupcake sandwiches! I have always wanted to buy one but never got around to it yet. The puzzle pieces I adore most. But cupcakes and the like are also very nice! Oh please please please :) I have been hanging for this set for months since the sneaky preview! I desperately want a set for my daughters 1st birthday in January. I like all of them! I guess I like the fairy the most because she is fun to decorate for my daughter!!!! Wow you have a lot of love on this site! I am headed back to work after Thanksgiving and would feel better if I es able to provide my kids with some Lunch Punch lunches. I want these also, very cute. Love these! So cute! They would be the perfect first lunch punch additions to my collection! So cute! I've asked Santa for some lunch punches- maybe I could win some before CHristmas! These are FANTASTIC! All of your creations are! You have inspired me to create "fun" lunches for my 3 and 2 year old. I currently do not have any Lunch Punches but need to invest in some! Keep of the GREAT work and your blog is great! Thanks! I'd love to experiment with these--too cute! I love love LOVE the cake/cupcake punch set!!! So fun!! Love gumball machines and cupcakes (my poor girls, I cannot pass up a shirt with either on the front). Would love to win a set of these new Sweet Lunch Punches! My little one eats so much better when her food is "cute" and she demands creations she sees on here LOL. I have one Lunch Punch set of transportation cutters: plane, train, car. My son loves the train the most because of the tender/caboose it produces. I would love some new cutters! So cute! I'm a little cupcake obsessed so thecupcake cutter is naturally my favorite! I'm so happy to have found your page! My daughter is a very picky eater. If I can 'dress her lunch up' with these cupcake punches, I think she'll start trying new things. We need your help, Please! If we don't win it's okay because we've already got a prize via "ANOTHERLUNCH". I would love a chance, thanks so much! I don't have any Lunch Punches yet, but I have been drooling over them, lol. These are TOO cute! I love them! What a fun way to jazz up a basic sandwich. I love the creativity and inspiration the lunch punch(and another lunch) brings to the table!!! :) You girls are the BEST!!! I would love this sweet set of lunch punches! I don't have any yet, but have been really inspired to make my son cute bento style lunches! 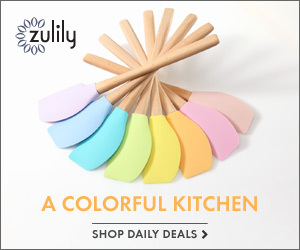 your site has such cute ideas! I have and love the Sand*wishes* set - but I can totally see myself doing a happy dance all around my house if I were to win this one. Can't wait to order if I don't win - but I don't see them on their site yet! completely and utterly adorable! makes me wish i lived in a big city so i could touch and feel them! my little guy gets pretty bored with sandwiches.....but not as bored as me! honestly, learning all i do from this site has kept my lunch sanity while we are only in grade one! ahhhhh! would LOVE to win this set....pretty please!?! Yay!!! so cute! i - i mean my kids - would love these!! Love all of your fun lunch ideas. These are so cute!! Your blog has really inspired me to be more creative with my sons lunches. He would love sandwiches made with this set. I have never used these before, but I think my 2 year old is getting old enough to enjoy this and I would love to try it! Thanks for the giveaway! These are just so stinking cute!!!! Those are ADORABLE!! And everything my two girls love :) I have not invested in the lunch punch sets just yet, but love to use other single shape cutters to do their sandwiches for school. And I find they eat more of it if it looks cute. We've 'liked' them on facebook and are looking forward to this sweet set! I mean we have been anxiously waiting for a couple of months now--yay!! These are adorable! I would love a set for my family. These look pretty amazing - would love to have a set for myself. Squee! Those are adorable! My daughters would love cupcake and gumball shaped sandwiches. Oh wow I think this is so CUTE.My kids would love to get a lunch with this inside. I have such a hard time getting these here! They sell out like crazy! The only way I can get my soon-to-be-four year old to eat properly is bento! My email is viaminorviator@gmail.com! I love making fancy sandwiches so these lunch punches would be perfect! I'm sure they would be verrrry popular at our house! Oh, and my email is erinn dot bartsch at shaw dot ca !! Ohhhh I want these!!!!! My email is kandipoirier @ gmail . Com !! My daughter would live these!!! What a great give away! Daughter Julia would kill for this set! WOW. SO cute!!!! NEW Lunch Punch SWEET!! LOL...really a truly special celebration should be had by all!!! LOVE LOVE LOVE Lunch Punch VRRRMMM and Sandwishes they do make for a special lunch :) If I don't win these I will def be purchasing them. Just starting packing the lunches for the kids this week. They adore the sandwiches cut from the Lunch Punch puzzle cutters I bought from Amazon. These would just be amazing to add to my brand new collection! These are AWESOME! Hope I get to give them a try! I LOVE the Lunch Punch! I met the owner at the ABC kids expo and I would LOVE to win one of these for my 3 kids. Love them. 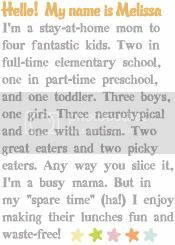 Claire, 5, would love her PB&J to look like a birthday cake. love these lunch punches...they are too cute! These lunch punches are so awesome! I can't wait to try some! I just bought my second set, cant wait to get them all! This is definitely next on my list! Oh! these are too too cute! I can't wait to try them! Hope I win!! I would love to try these out! What a great site you have! Very cute! Love spicing up my kid's lunch. Those are adorable!!! Our current fav is the flower one (it's purple), adorable with fruit leather accents ;) !!!! My dd loves when I make her lunch interesting. I am not very creative and the lunch punches help with that. She would absolutely love the whole set but I think her favorite would be the gumball machine. Adorable! My son is sitting next to me and thought the cupcake sandwich you made looks good! We use and love the car lunch punches in our house for school lunches. Those are just amazing! We don't have any lunch punches yet! I'm always looking for different ways to get my 7 year old to eat sandwiches! This would be the perfect way to make that easier! You are so creative - I can't wait to check out more of your posts! I love lunch punches wish I had some!! These are adorable! I've been seeing all the lovely shapes you all find, but haven't any of my own yet. Thanks for an awesome giveaway! How cute are these! This would make my 5 year old a very delighted boy! Thanks for such an inspiring blog. They must be mine! I love my Lunch Punches (I have all but the Aussie cheese-giveaways) and especially love how easy they are to clean! I think twice about using my hand-wash-and-immediately-dry metal cookie cutters, but these are a no-brainer! Cute. I haven't ventured into making cute shapes w/ the sandwiches, but maybe it would make the sandwiches disappear into their tummy better. My little miss would ADORE these! So cute. Those are so adorable! All the girls in this house would love those (yes, that includes me!)! These are so cute! I love their puzzle cutters too! So cute, my kids would love these! So cute, my daughter would love this! Those are adorable!!! I wish they had these when my son was younger... I spent a lot of time cutting his sandwich into shapes (sometimes cookie cutters, sometimes freehand). I think all of the Lunch Punch shapes are awesome... thinking about getting a set or two for my friend (her kids are 1 & 3).